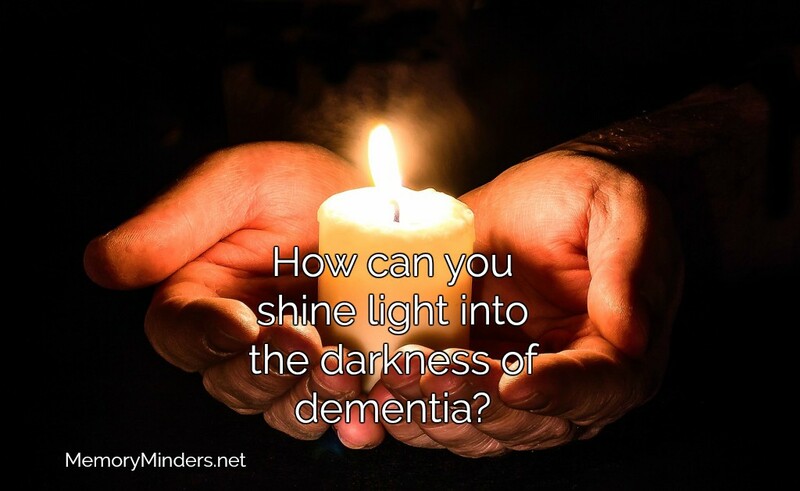 The darkness of Alzheimer’s and dementia can be oppressive. But it doesn’t have to be. Many lights are shining into this darkness if only we search for them. I found many lights while sharing and learning at the WI State Alzheimer’s Conference a few weeks ago from other professionals, caregivers and those with Alzheimer’s. The brightest light I found was from those with early onset Alzheimer’s and shared here last week: life is a gift, honor it and find the beauty in each day. 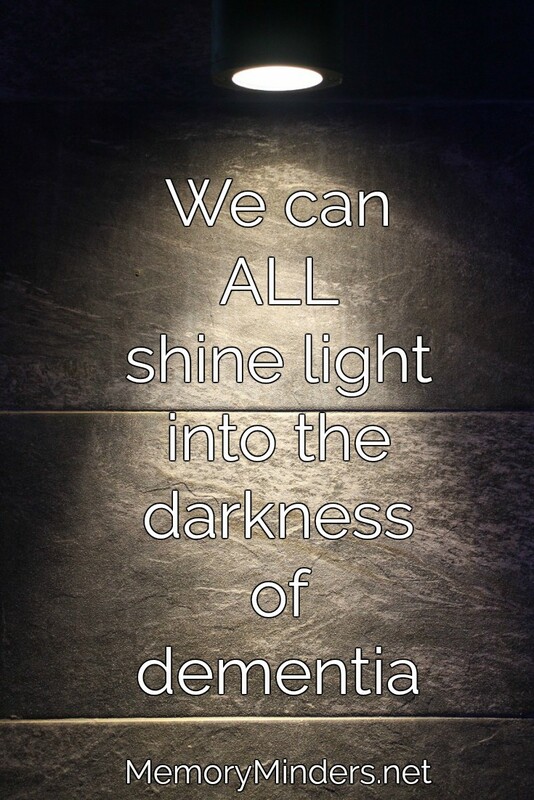 Let’s remember, we ALL can do something to shine a light on this growing national health crisis of Alzheimer’s and other dementias. I want to share some of what I’ve learned and hope you’ll be inspired to make yours and others’ moments memorable. Dr. Michele Braun shared insight on understanding those with the lesser known diseases of dementia like Lewy-Body, Frontotemporal Dementia, Primary Progressive Aphasia and Vascular Dementia. These all have different causes and cannot be treated the same. This is why all dementia professionals advocate for a thorough diagnosis from a neurologist or neuropsychologist for the best treatment plan. It makes a difference! Different areas of the brain impacted by the disease dictate corresponding limitations. Brain imaging and a thorough behavior history from the person affected AND their care partner is imperative. Persons exhibiting behaviors and hallucinations from these types of diseases cannot control them. Don’t argue or engage too much with the experience, but redirect and regroup. Manipulating triggering events or consequences of behaviors can mitigate and help manage unwanted behaviors. Dr. Cynthia Carlsson from the University of WI-Alzheimer’s Disease Research Center shined a light on the latest research trends and projects. No new drugs have been approved for Alzheimer’s in about 20 years! However, researchers are excited they now can see pre-clinical biomarker signs of amyloid and tau (physical hallmarks of Alzheimer’s disease) with new brain imaging methods. They can now study those with these biomarkers and detect potentially modifiable conditions to eliminate or delay symptoms of dementia from developing. Research is also expanding into additional other modifiable behaviors such as the MIND diet and other nutritional agents like coconut, flavonoids and vitamin D. The role of anti-inflammatory and hormone therapies, and blood pressure medications are also being studied. But research happens through participation. If you or a loved one is interested in potentially contributing to or participating in any of these studies contact the ADRC. Anyone who has known a person with dementia from Alzheimer’s or another disease understands at some point, they can no longer function alone. Enter the caregivers. Whether unpaid (as so many are) or professionals, caregivers need special care too. If they don’t care for themselves, their own health and even those they care for can be impacted. Wherever I present on this topic, a recurrent theme arises: there are never enough resources. Whether it’s personnel, time, money or even a simple thing like having adequate supplies, it all leads to one feeling: frustration. None of us can solve health care issues alone, but one thing we can all do as personal or professional caregivers is to remain focused on the person(s) we care for. Thanks Kathleen! I pray they are helpful and inspire all to action toward memory wellness!